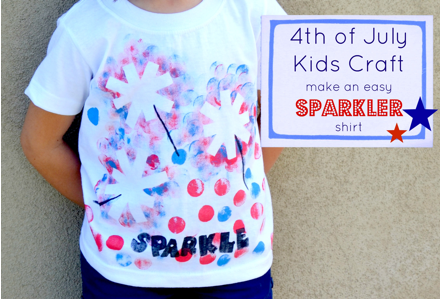 Kids Craft: A DIY Sparkler Tee for the 4th of July! We are getting ready for the Fourth of July with a few fun projects. Last year my daughter held a sparkler for the first time as we watched fireworks. She has been talking about the upcoming holiday and how much fun she had with the sparkler last year. This week she helped me make her an easy sparkler shirt. Place the piece of cardboard inside the shirt. Then use the washi tape to create several sparkler shapes on the front of your shirt. Next use the foam brush to paint over the washi tape with red and blue paint. Paint the foam stamps with black paint and stamp “sparkle” along the bottom of the shirt. I supervised as my daughter completed all of the painting on her own. She did a great job with the letters! Allow the paint to dry and then gently peel off the washi tape. After my daughter had forgotten about her drying shirt I went back and painted thin black lines to look like sparkler sticks. If you’re crafting with older children, they could easily draw the lines themselves. My daughter was so proud of her creation and excited to wear her new shirt! Do you remember the first time your child held a sparkler? 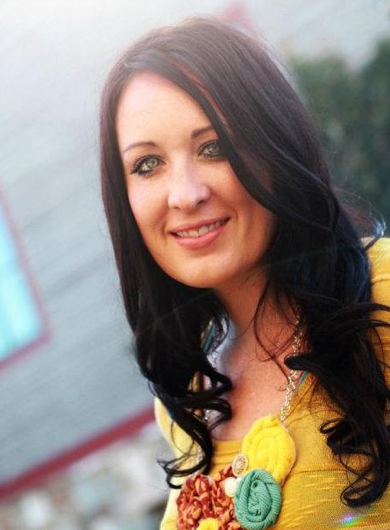 Heather is a preschool teacher and mommy to one sassy lit­tle girl. She shares fam­ily activ­i­ties, class­room ideas, snacks, and kids crafts at her blog, Brie Brie Blooms. « Simple & Sweet Father’s Day Gift!